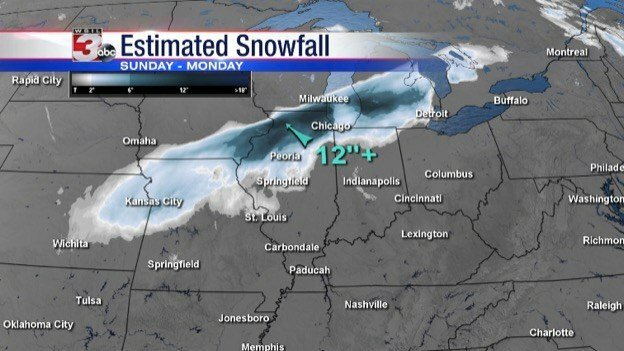 WSIL -- Significant amounts of snow have accumulated across much of the Midwest. Winds led to blizzard warnings being issued across several Midwest states. Blowing snow limited visibilities, causing significant travel hazards. While not everyone saw travel forbidding snow fall, some locations in northern Illinois saw accumulations greater than 12 inches. Chicago's O'Hare International airport canceled nearly 1,368 flights as of 7:30 p.m. Despite all of this, UPS packages should be running on time this week. The company issued a statement saying, "We aren't experiencing any weather delays at this time." UPS says the last day to order and receive your items by Christmas Eve, is December 21st. But, it could cost you. Depending on size and destination, additional shipping surcharges during that time period could range anywhere between $0.84 and $165. FedEx's cut-off is also December 21.